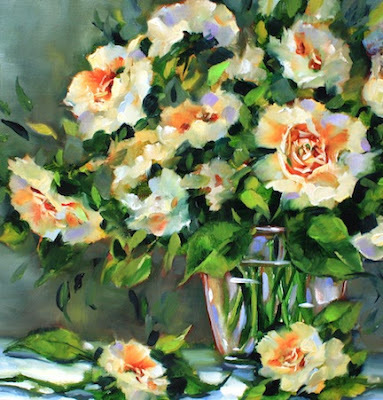 Free Fall White Roses is a new work in the studio. I'm excited to announce my new North Texas workshops at the Jaycee Park Center for the Arts in Irving, Texas in June and August. For those who are not familiar with North Texas, the Jaycee Center is just a few miles from DFW International Airport. There are plenty of hotels and restaurants nearby, and it's super convenient for those coming from out of town. 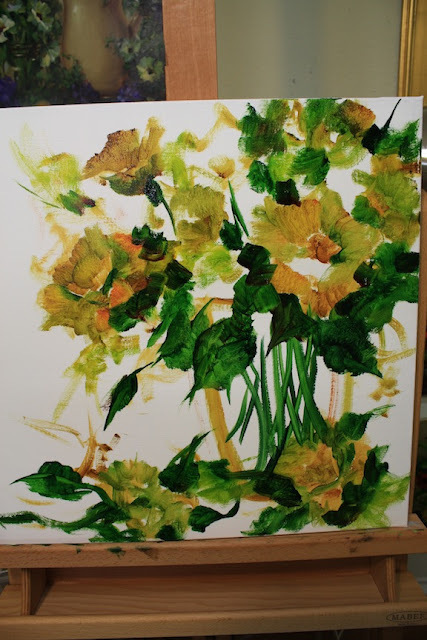 We'll be painting summer flowers in oils, working from fresh flowers. 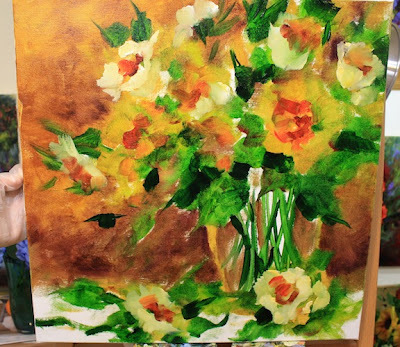 I'll do a demo in the mornings, and then we'll paint together in the afternoons. And the question that is on all of the minds of former students, no doubt.... will there be donuts? Yes! And I promise I won't let them slide off the passenger seat of the car and into the floor with the lid open. To celebrate all this good news, I'm sharing step by step Free Fall White Roses with you below. I already ate all the Dove chocolate and didn't share any of it with the hubby tonight. I'm not ashamed to say it was delicious. And I would do it all over again. Check out my new workshops here! Step 2 - getting that real estate covered! Fini - as the models take a bow! 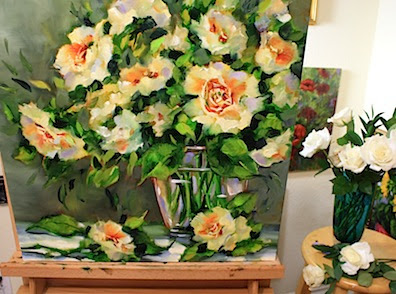 White roses are so beautiful and so is your painting, Nancy. Oh to be able to take a workshop! Maybe one of these years! Your flowers are always just totally beautiful Nancy, but I adore that little house! Any possible way of recording your class/video taping it so we can take the class "from afar"?? I would love to attend one of your workshops - but have two more years before retirement!! look at the light and movement in your flowers, vase and water! Your roses are so beautiful. I love the postings here, but to really appreciate their beauty one must see them in person!